Smokemont Loop, Hike the Longest Footbridge You've Ever Seen! Smokemont Loop was a great adventure for us when we hiked it. It's a moderate 6.1 mile hike from Smokemont Campground. I recommend starting the trail at the Bradley Fork end. It's a little easier that way. Begin by hiking the Bradley Fork trail. The trailhead is near the hikers' parking area at the end of the campground's D Loop. After about 2 miles, you'll reach the junction for Chasteen Creek. I recommend taking it because there's a cascade and small waterfall along this trail. It only takes 0.7 miles to reach the cascade, which is more impressive than the waterfall. 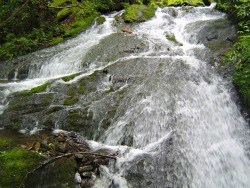 After checking out the cascade (and possibly waterfall) head back to the Bradley Fork Trail. Be on the lookout for wildflowers. 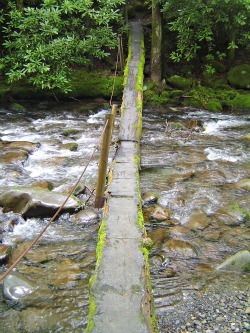 You'll reach the Smokemont Loop trail junction at the longest footbridge I've ever crossed in the Smokies. At the time, the bridge was out, but we were able to cross it because the water wasn't high. This is the part that made this hike an adventure for us! There will be a small cemetary on your right as you head back toward the campground. From Oconoluftee Visitor Center, continue on Newfound Gap Road to Smokemont Campground (on your right).